• Rolle’s Theorem and the Mean Value Theorem. • L’Hôpital’s Rule for evaluating limits of indeterminate forms. The function is said to be differentiable at every x for which this limit exists, and its derivative may be denoted by f ′(x), y ′, or Dx y. Frequently Δx is replaced by h or some other symbol. The fraction is called the difference quotient for f at a and represents the average rate of change of f from a to a + h. Geometrically, it is the slope of the secant PQ to the curve y = f (x) through the points P(a, f (a)) and Q(a + h, f (a + h)). 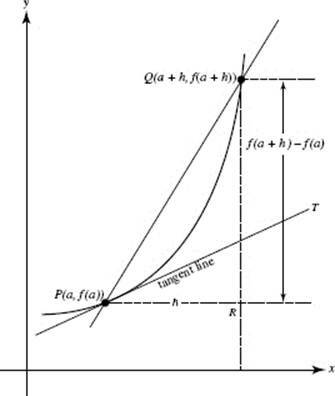 The limit, f ′(a), of the difference quotient is the (instantaneous) rate of change of f at point a. Geometrically, the derivative f ′(a) is the limit of the slope of secant PQ as Q approaches P; that is, as h approaches zero. This limit is the slope of the curve at P. The tangent to the curve at P is the line through P with this slope. In Figure N3–1a, PQ is the secant line through (a, f (a)) and (a + h, f (a + h)). The average rate of change from a to a + h equals which is the slope of secant PQ. 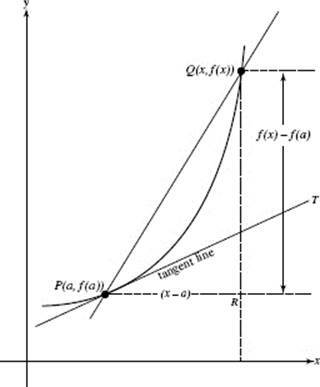 PT is the tangent to the curve at P. As h approaches zero, point Q approaches point P along the curve, PQ approaches PT, and the slope of PQ approaches the slope of PT, which equals f ′(a). The second derivative, denoted by f ″(x) or or y ″, is the (first) derivative of f ′(x). Also, f ″(a) is the second derivative of f (x) at x = a.